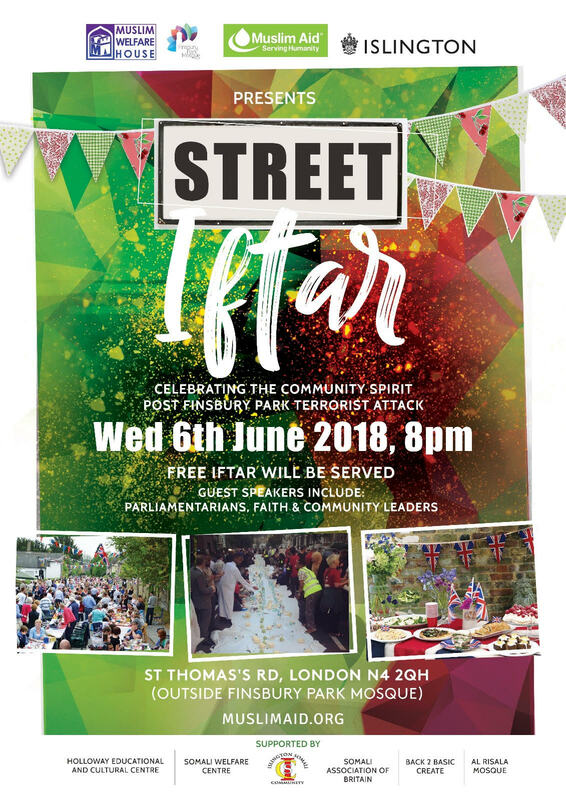 One year on from the Finsbury Park terrorist attack, Jeremy Corbyn, other high- profile parliamentarians and representatives from all faiths will join with the community for a Street Iftar. The event on Wednesday 6 June is being organised by the Muslim Welfare House, Finsbury Park mosque and the charity Muslim Aid to pay tribute to those affected by the incident but also to celebrate the public spirit following the attack. The attack which occurred outside the Muslim Welfare House on 19 June 2017, tragically  killed one man and injured eight people  when a van drove into pedestrians. Imam Mohamed Mahmoud led the community in a peaceful response when he urged the crowd to be calm and restrained following the attack. All are welcome to join this British style summer street party combined with a traditional Iftar. The event aims to highlight some of the common British and Muslim values, like looking after ones’ neighbours and coming together in times of crisis. It will commemorate the incident but also celebrate our intermingled cultures and strong community spirit. Imam Mohamed Mahmoud, from the Muslim Welfare House, said: “Our primary concern has been for the victims and their families who continue to deal with the consequences of this terrible attack. What was shown following that night is that these events bring out the best in all of us, as diamonds are only formed under pressure. We received outpourings of support from all over the world from people of all backgrounds who have the capacity to care for others whom they have had no contact with. Imam Mohamed Mahmoud, from the Muslim Welfare House, will make the closing speech. Foredul Islam, National Events Manager for Muslim Aid, said: “It was a terrible incident, but it was followed by amazing support and cohesion within the community, so it’s important that we appreciate and celebrate that. The Finsbury Park incident was investigated by counter-terrorism police as a terrorist attack. On 23 June 2017, Darren Osborne, who drove the van into pedestrians near the Muslim Welfare House, was charged with terrorism-related murder and attempted murder. In February 2018, he was found guilty on both counts at Woolwich Crown Court and sentenced to life imprisonment. Muslim Aid is one of the top 20 UK relief and development agencies, alongside Christian Aid, Save the Children and Oxfam. It was set up in the UK in 1985 to provide humanitarian assistance to disaster affected countries and to help poor communities overcome poverty. Muslim Aid covers 70 countries, working with all communities irrespective of faith, ethnic origin or political system. Muslim Aid also has some UK programmes.